Great for small or large areas, this line of gasoline driven snow throwers use reliable Troybilt or Briggs and Stratton engines with a 2 year warranty. 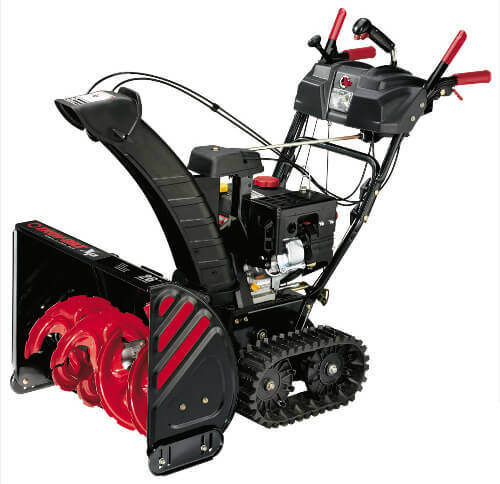 Easily manoeuverable yet powerful for deep and heavy snow. These gas snow throwers can cut down the time and effort to remove snow from areas such as driveways, sidewalks, and parking areas. Be sure to take proper steps for safety and as with anything, good maintenance will ensure long term use. Some of these units have deluxe features like in dash headlights for low visibility, power steering and heated hand grips. Cleaning paths range from 21” for smaller areas to 45” for open large spaces. All models have electric start and mitten grip manual recoil if you need to pull start and have heavy gloves on. We've packed a surprising amount of snow-clearing capacity into a compact, easy-to-handle unit. This single-stage snow thrower is lightweight and manoeuverable - and features a reliable 4-cycle engine (no more mixing oil and gas!) and push-button electric start for easy, no-hassle operation. 208cc 4-cycle OHV engine -- no mixing of oil and gas! 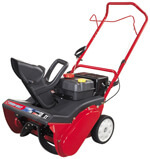 When the forecast calls for a foot or more, count on this 2-stage snow thrower to pull through. 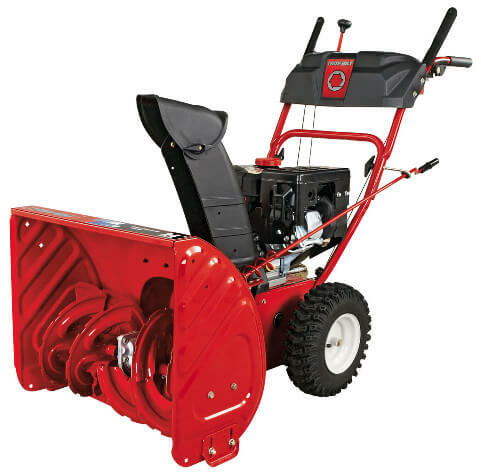 Quick starting and easy to operate, this model snow thrower will cut into drifts with its 21" intake height and steadily clear the way, 24" at a time until the job is done. This model 2-stage snow thrower is designed to deliver added power and greater clearing width. Just One Hand operation lets you steer with one hand, freeing the other hand to adjust the chute direction without stopping. And with a wide 26" clearing width, your drive will be clear in no time. The deluxe 2-stage gas snow throwers offers you added power and a 28" clearing width to tackle the biggest jobs -- even heavy, wet snow. Aggressive tires offer greater traction in all conditions, while an in-dash headlight and reflective strips allow you to clear snow more safely in low-visibility conditions. Just One Hand operation - steer with one hand, freeing the other hand to adjust the chute direction without stopping. 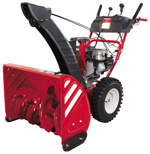 This wide 2-stage snow thrower features a 30" clearing width, Touch 'n Turn power steering and heated hand grips, plus an in-dash headlight and reflective strips for greater visibility in low light. 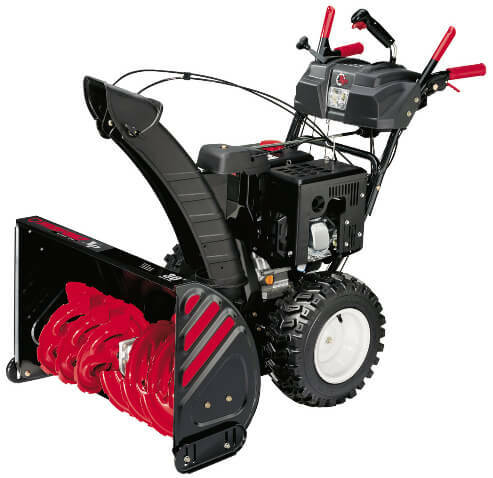 It's easy to start, easy to operate and so solidly constructed, it's easy to see why this snow thrower will tackle winter's toughest tasks and still be around for years to come. 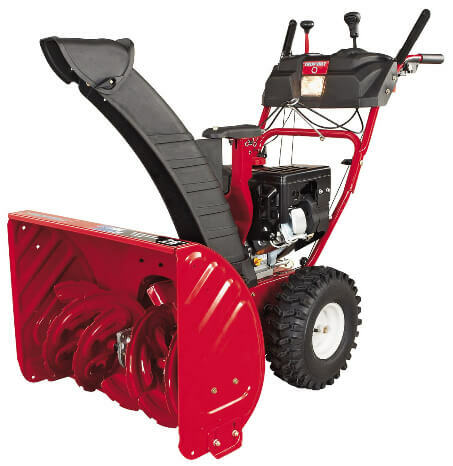 This rugged 2-stage snow thrower features a 26" clearing width, Touch 'n Turn power steering and heated hand grips, plus an in-dash headlight for better visibility. Three different SelecTrac Drive modes shift the unit's weight for optimum performance on hard-packed or icy snow or on gravel driveways. 10" of track remains on the ground at all times for superior traction in all weather conditions. Heavy, wet, deep or drifted: no snow is too much for this over-sized 2-stage snow thrower. This snow thrower boasts our widest clearing width - a full 45 inches - and our most powerful engine to make even the biggest job manageable. Touch 'n Turn power steering provides the ultimate in manoeuverability. Just One Hand operation - steer with one hand, freeing the other hand to adjust the chute direction without stopping. Crank chute and remote pitch control. 13-gauge commercial steel frame. Do not disable your snow blower’s operator presence control. Most snow blowers built since 1975 have an operator presence control (OPC) that causes the snow blower to stop when the user lets go of the controls. Handle gas carefully. Avoid spillage by using non-spill containers with spouts. Fill up before you start, while the engine is cold. Do not use a snow blower on steep slopes. Use extreme caution when clearing snow from mild slopes, especially when changing direction. Never operate a snow blower without good visibility or light. Read your owner’s manual thoroughly and understand all of the recommended safety procedures before using your snow blower. Clear the area of doormats, sleds, boards, wires, and other debris that may be hidden by the snow. These objects could clog the chute, or otherwise cause damage. Never put your hands inside the snow blower chute for any reason. If the chute becomes clogged with snow (or another object), turn it off, wait for all moving parts to come to a complete stop and then clear the chute with a stick. Never allow children to operate outdoor power equipment. Keep the area of operation clear of children, pets, and all people. Never allow anyone in front of your snow blower. Avoid blowing snow toward people or cars. Dress properly for the job. Be sure to wear adequate winter clothing and footwear that will improve footing on slippery surfaces. Wear safety glasses, and avoid any loose fitting clothing that could get caught in moving parts. Be careful of long hair. Never run, when using gas snow throwers. Only walk. Always be sure of your footing and keep a firm grip on the handles.